Artists constantly play with our perceptions of the world, the “known” – revisiting them, proposing altered possibilities, and presenting us with new ways to engage with our surroundings. Last weekend, during the RAWdance’s CONCEPT series 15, choreographer Jo Kreiter transformed a bicycle into both a hanging sculpture and a dance partner in TORQUE/Dance on a Bike on a Rope. Performer Sandia Langlois successively rolled, hung, pushed, climbed, and was swept away by the two-wheeler in a way that makes it now impossible for me to look at the common bicycle as a simple tool for navigation. 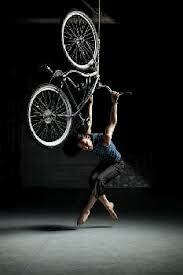 Not unlike the cycle sculptures that artist Max Chen created for choreographer KT Nelson’s Transit, Kreiter and Langlois converted the bike into an astute and poetic partner. 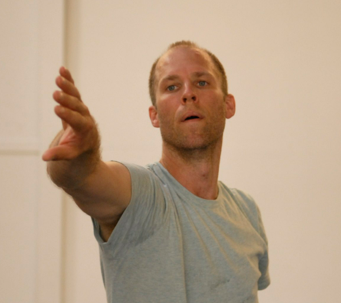 In the same program, dancer and choreographer Christian Burns challenged the common perception of repetition as an action deprived of the new. Improvisation #72 started as Burns sat on the bleachers’ steps, stood up, looked left before entering the space with the calm receptivity of a seasoned performer. Throughout the piece, Burns repeated the sequence, coming back to his point of departure, at times altering the trajectory and outcome of his journey. The score superimposed Johann Sebastian Bach’s music with the voice of Burns sharing notes that he had taken during his research. Some read: “Repetition is about new outcomes… To repeat is to approach another new future in that moment.” Burns’ investigation quietly called to mind Danish philosopher Søren Kierkergaard’s work Repetition in which the protagonist questions whether repetition is even a possibility. If one could recognize movements that the dancer had performed earlier, Burns’ ability to dig into the present moment through his physicality brought the viewer to consider each gesture as entirely fresh, an open door to a new landscape. At ODC Theater the same weekend, Philadelphia-based choreographer Nichole Canuso helped me hear Frédéric Chopin’s Nocturnes in a new way. As she sat still in her Midway Avenue, she interrupted a two-minute silence to narrate the specific circumstances in which Chopin created the Nocturne that was playing in the background. She recounted that Chopin had composed the score while on the Spanish island of Mallorca, on a day of torrential rain. When Canuso resumed her silence, I found myself reading the melancholy and accents of the Mediterranean weather that the composer incorporated in the music. At other times, she emphasized its gusto by letting her monologue be sharply interrupted by a rush of vivacious notes that jolted her to another side of the stage. Throughout the piece, Canuso allowed the viewer to both hear and see new facets of Chopin’s versatile music. This experience of renewed perceptions reminded me of New York-based choreographer Doug Elkins, who will be performing at the Walking Distance Dance Festival-SF at ODC (May 30-31, 2014). Elkins is known for reinterpreting classics and offering new ways of experiencing them. His Fraulein Maria (2006) shed new light on the 1959 musical The Sound of Music. With Mo(or)town/Redux (2012), Elkins revisited José Limon’s The Moor’s Pavane (1949), and provided his own take on William Shakespeare’s Othello. In the piece, the dancers weaved modern dance steps with hip hop grooves set to the tunes of Marvin Gaye, James Brown, Otis Redding and Amy Winehouse. Elkins started his career as a B-Boy, touring the world with break dance groups New York Dance Express and Magnificent Force. He is recognized for crafting witty and humorous dances that mingle many genres of dance, providing what he calls a “collision of languages.” Dance critic Joan Acocella wrote that he will frequently “come out in front of the audience in his socks and do deadpan comedy.” It is therefore not a surprise that Hapless Bizarre, his most recent work and the one he will present at the Walking Distance Dance Festival-SF, explores the boundaries between physical comedy and dance. Referencing early performers like Chaplin, Tati, Keaton, and The Marx Brothers, Elkins investigates the colossal expressivity of the body. In anticipation of Elkins’ performance, I am curious to discover in what direction the choreographer will instigate yet another shift in the way we experience dance. One of the most informative ways to measure the pulse of a culture is to take a close look at the art that it is producing. Through their work, artists dissect social issues, offer a conduit for expression and shape identity. Acting as a kind of stethoscope, the arts allow us to detect society’s vitality, and the issues and conflicts that produce its contemporary dialogue. This is where SCUBA Touring Network is making a difference. A partnership between The Velocity Dance Theater in Seattle, ODC Theater in San Francisco, Philadelphia Dance Projects and the Ritz Theater in Minneapolis, SCUBA provides precious touring opportunities for local dance artists and their peers from around the country. Now in its ninth season, SCUBA presents four companies this coming weekend at ODC Theater. NAKA Dance Theater’s The Anastasio Project and SuperGroup’s The Tent Has Been Pulled Down, which are part of this year’s edition, share an interest in broader socio-cultural issues. Based in Minneapolis and founded in 2008, the collaborative ensemble SuperGroup brings together the artistic voices of Erin Search-Wells, Sam Johnson and Jeffrey Wells. 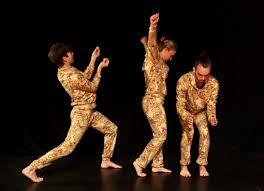 Their recent work questions the multitasking performing body by layering text, movement and sound. 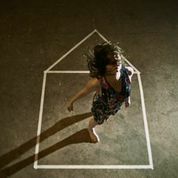 Interested in the intersection of dance with other arts, they explore the forms and content of contemporary dance by using improvisational and chance methods developed by choreographers such as Trisha Brown, Merce Cunningham and Yvonne Rainer. A choice for transparency, whether in theme or execution, appears in the two solos of the program, Elia Mrak’s Erica and Nichole Canuso’s Midway Avenue. Performed in silence, within an undressed performance space, Elia Mrak’s piece strips the dance down to its essentials, and presents the moving body in its intrinsic relationship to gravity, rhythm and space. Based in Seattle, Mrak defines himself as “a storyteller” and is versed in many movement practices, including Qigong, Bboying and Flying Low, a technique that focuses on the dancer’s relationship with the floor. By presenting works created in places that are on the fringe of a performing map still largely dominated by New York, SCUBA provides a clear indicator of the beating pulse of the larger artistic scene. Does location influence the artists’ creative decisions? Or is it in some ways irrelevant when artists are approaching universal questions? How does each artist’s singularity resonate? What is the common thread, if any, that we can decipher throughout the four pieces? These are just a few of the questions one might consider during the evening’s multi-faceted program. A previous post focused on the legacy of dance artist Ruth St Denis’ observed through the eyes and choreographic mind of LA-based choreographer Lionel Popkin, whose recent work, Ruth Doesn’t Live Here Anymore, questions the cultural appropriation of Eastern sensibilities in St Denis’ dances. The line between appropriation and plagiarism continues to remain razor thin and at times blurred. It has led to many contentious debates and legal actions initiated by artists who claim not to be artistically and financially recognized when their work is sampled without their permission. If these debates mainly occur in the visual arts and music industry, they also intrude into the dance field. A recent example was pop singer Beyoncé’s accusation of plagiarism in her 2011 video ‘Countdown.’ In the video, the singer reproduced movements, costumes and set elements from Belgian choreographer Anne Teresa De Keersmaeker’s pieces Achterland (1990) and Rosas danst Rosas (1983). The incident allowed De Keersmaeker to reflect on some larger issues: “Why does it take popular culture thirty years to recognize an experimental work of dance? Is [thirty years] the time that it takes to recycle non-mainstream experimental performance? The questions raised by De Keersmaeker about plagiarism, popular versus non-mainstream art, and gender representations all find their way in O’Neal’s piece. From B-girl breaking on the dance floor to pole-dancer wearing high heel stilettos the heights of San Francisco’s Coit tower, O’Neal takes the viewers on a movement journey that investigates cultural representations of gender, the female body and sexuality. If DJ Shadow evokes the possibility to recycle artistic material into something new, some criticize sampling as the inability for artists to create original work. O’Neal joins the conversation by addressing the relationship between appropriation and creativity. In The Most Innovative, Daring, and Original Piece of Dance/Performance You Will See this Decade, which O’Neal describes as “a nonverbal lecture demonstration/dance experience,” names of past and current artists, as well as statements and questions pertaining to cultural sampling, move through three screens, behind the performer, adding a layer of text to the physical texture of her performance. At one point, the question “How do you set yourself apart when everything is a remix?” appears on the screen. With its superlative-filled title, O’Neal’s piece points to our sensational-hungry culture, forever in search of the next big thing, and debates both the reality and possibility of the new. 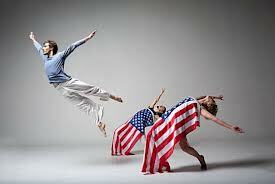 ridetherhythm is one of three premieres that Hope Mohr Dance will present at ODC Theater from April 10 to 13. In the opening scene of Mohr’s Route 20, which also premieres next week, a dancer enters the stage with a quick, staggered step, and advances with feet and knees wide open, while one rigid arm, antenna-like, pokes forward inquisitively. The seeing in this movement is not only the optical, but is also transformed into a mechanism for the sensory, in which the entire body is incorporated. This first gesture from Route 20 signals one of the core operating modes of Mohr’s work: to interrogate space and disclose its content. In addition to focusing on transparency, Mohr’s work explores the cultural issue of female agency and challenges traditional representations of gender. Characterized by a collaborative approach, it also redefines the role of performer and choreographer, and stretches the choreographic material so that it takes on qualities inherent to both visual arts and music. Currently an artist-in-residence at ODC, Mohr created Hope Mohr Dance in 2007 after performing with postmodern dance choreographers Trisha Brown, Lucinda Childs and Douglas Dunn, while receiving a law degree from Columbia University. Mohr’s questioning nature prods her to examine what exists beyond appearances. The set of several of her works offers a visual testimony to her interest in turning the inside out. 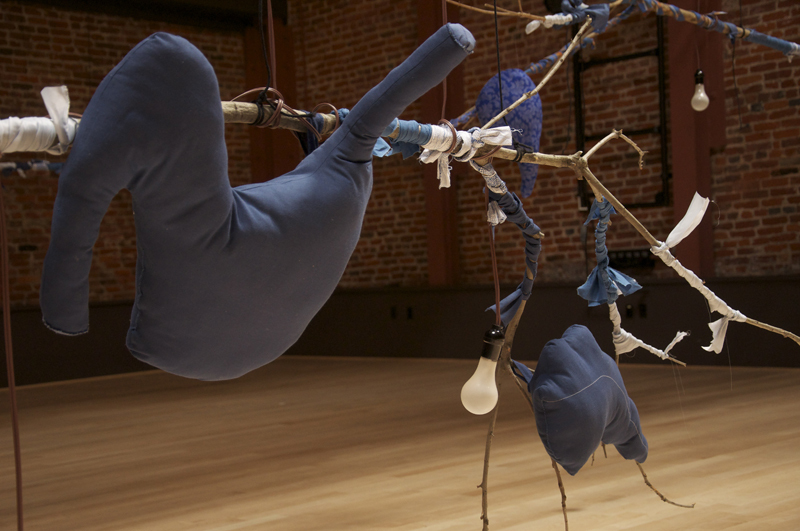 In Failure of the Sign is the Sign (2013), artist Katrina Rodabaugh’s set is a poetic rendition of the inner landscape of the body: tube-like forms of plush blue fabric extend upstage, some in the shape of organs. 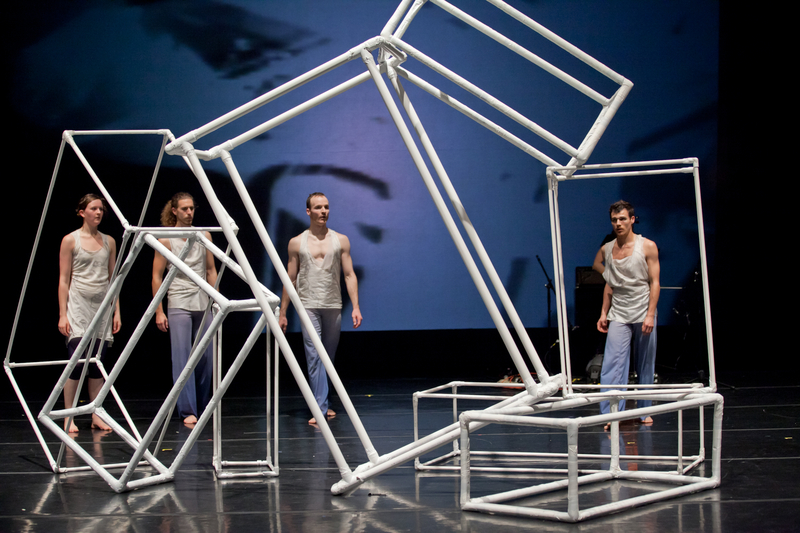 The set and the movement vocabulary confront the viewer with both inner and outer worlds. Similarly, inside and outside spaces are exposed in Zakary Zide’s white rectangular PVC pipes that populate Reluctant Light (2012). These bone-like structures offer performers a place to move through, cave in, and manipulate. the absurd flippers the grave and awkward mask. In Rich’s poem, the protagonist is actively looking for “the myth, not the story of the myth.” Similarly, Mohr’s performers search for essentials beyond the story. Tegan Schwab suddenly embraces James Graham’s body on the floor before rolling away from him, as he stands up and jumps over Jeremy Bannon-Neches’ body in an abrupt act of union. Yet, the stories that usually build within relationships –courting, loving, betraying, etc- don’t seem to unfold here. Stripped of the usual markers of a narrative, the piece alternates interchangeable partnerings, and hints at the possibility of an alternative way of relating, beyond the traditional coupling of two or ménage à trois. In Failure of the Sign is the Sign, the performers interact with the fabric pieces. 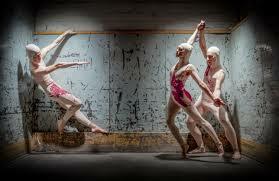 Their bodies wrap around the soft, long-limbed sculptures until set and performer become one. Through the props, the inside of the body becomes a performing entity. Route 20 also features a performing object: a massive block of ice, that embodies opposite qualities of cold and hot, solid and liquid. Moving at a dissonant pace from that of the performers, it exists in relationship to them, adding a layer to their rhythm, and “blurring the power dynamic between human and non-human entities” as Judy Hussie-Taylor wrote in regards to objects taking on a performative presence in her introduction to the Danspace Project Platform 2010. Mohr’s work often blurs the line between practice and performance, such as in her collaboration with dancer Christian Burns and musician David Szlasa. In metrics of intimacy (2013), Mohr and Burns share their improvisational process on stage, investigating the question “When does practice becomes performance?” The soundscape includes recordings from conversations between the performers during rehearsal, creating an indefinite territory between the studio and the stage. In Failure of the Sign is the Sign, the audience walks into the theater to find Schwab intertwined and moving organically with one of Rodabaugh’s long limbs of blue fabric. Playing with time, the piece stretches the edges of performance. At times, dancers also take the roles of dramaturges. Notes Toward a Supreme Fiction (2014), which will also premiere as part of the company’s 7th home season, includes moments of improvisation, where the dancers respond kinetically to their inner and outer environment. Mohr writes in her blog The Body is The Brain: “Because neither music nor story anchors postmodern dance, postmodern performers have a bigger responsibility than in classical or modern dance (e.g., Graham) to be dramaturges for choreographers. Again, [André] Lepecki [says]: ‘The dancers in most contemporary works today have to produce the material, to think about the scenes, they have to choreograph themselves. So, it ends up that the dancers are also making dramaturgical decisions in a way. They’re making the choreographic decisions and they come up with ideas to solve the scenes sometimes.” In Notes Toward a Supreme Fiction, as Graham voices ‘Bend!’ the rest of the dancers interpret his vocal instruction with their body. Within the framework of the piece, dancers give directions to one another, for a slight moment, reflecting a power shift within the structure of the choreography. Additionally, Mohr has blurred the lines typically defining a choreographer by taking on a dramaturgical or curatorial role through her commitment to heighten the critical discourse around dance in the Bay Area. She established the Bridge Project, a program through which she invites choreographers and teachers to the Bay Area for teaching and performing residencies. 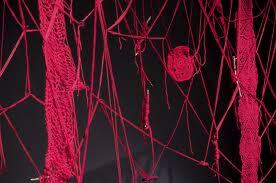 Invited artists have included Susan Rethorst (2013), Dusan Tynek (2012), Liz Gerring (2011), and Molissa Fenley (2010). Susan Rethorst set her Behold Bold Sam Dog on a cast of local choreographers –including Mohr- as part of Mohr’s home season at ODC last year. The evening featured Mohr as choreographer, curator and performer. 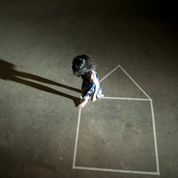 Mohr’s exploration of boundaries also appears in how she pushes the medium of dance to become otherly and to incorporate multiple forms of creative practice, such as the visual arts. In Failure of the Sign is the Sign, David Schleiffers settles one of Rodabaugh’s fabric pieces on his shoulders. 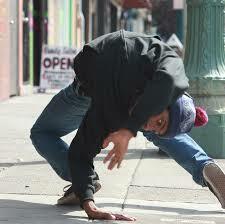 The moment is sculptural as the gesture allows the body to transfer into static form. Again this shift appears in Notes Toward a Supreme Fiction when Schleiffers stands in a diagonal facing upstage, while Lindsey Renee Derry climbs on his shoulders before falling into Bannon-Neches’ arms. As Derry climbs repeatedly on his back, Schleiffers keeps the immobility and stature of a bronze sculpture. Similarly, in Route 20, the three performers form a triangle, their cheeks motion towards each other, and one can visualize them touching, although they remain a few feet away from each other. The moment gives both volume and form to the negative space that surrounds their bodies. Mohr mentions that she “continue[s] to be interested in the cultural problem of female agency.” In light of Mohr’s comment, the red yarn of Plainsong can also possibly evoke the bloodline that links generations of women to each other. Mohr’s piece seems to question the possible trappings of an individual into existing representations and roles. How does one step out of the confinement of tradition, whether cultural, patriarchal or choreographic? In addition to Plainsong, The Force that Drives the Flower (2009) investigates the myth of Demeter and Persephone, while ridetherhythm gives voice to Antigone. Mohr’s focus on the female protagonist in Greek myths recalls choreographer Martha Graham’s predilection for Greek heroines (Think Medea in Cave of the Heart, or Clytemnestra in Graham’s dance by the same name). Although Mohr and Graham belong to different choreographic genres, a comparative analysis of Plainsong and Graham’s Night Journey, opens up new levels of reading into Mohr’s piece. In Night Journey, Graham revisits the myth of Sophocles’ Oedipus Rex, by giving Jocasta, Oedipus’ mother and lover, the central role. Graham replays the myth by emphasizing a woman’s psychological journey, but remains within Sophocles’ narrative, unchanging its end –suicide- for Jocasta. Plainsong also focuses on the female character’s life within the confinement of socio-cultural expectations. Yet the dance’s ending empowers the woman: upon finding a pair of scissors in the red yarn tapestry, the performer quickly cuts the yarn, drops the scissors, and steps offstage, freeing herself from the narrative that encloses her. Contrary to Jocasta’s grandiose hanging in Night Journey, Penelope’s exit is furtive and unassuming, further evidence of Mohr’s preference for abstraction and postmodern discourse. Within the latter, the piece offers an insight into the possibility of creating a narrative of one’s own. Mohr continues to subtract the layers of inherited models in order to articulate her artistic voice. In her many roles as a writer, performer and choreographer, she questions the process of art making and the essence of an artwork with a rigorous dedication to the choreographic craft. Her dances offer spare but meticulous compositions where both body and space become a laboratory for research and inquiry about what it means to make art and how it relates to our lives.